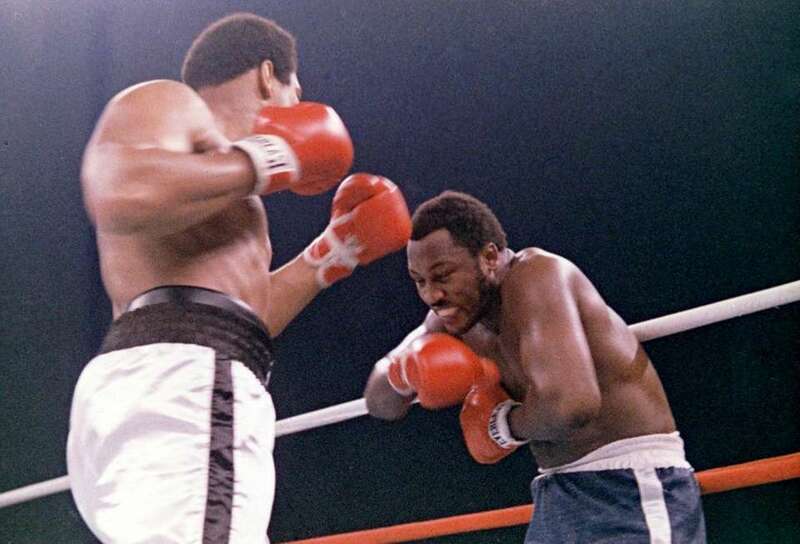 Whether the backdrop was political, racial, cultural, financial or something else, these 17 boxing matches are among the most important to the sport. 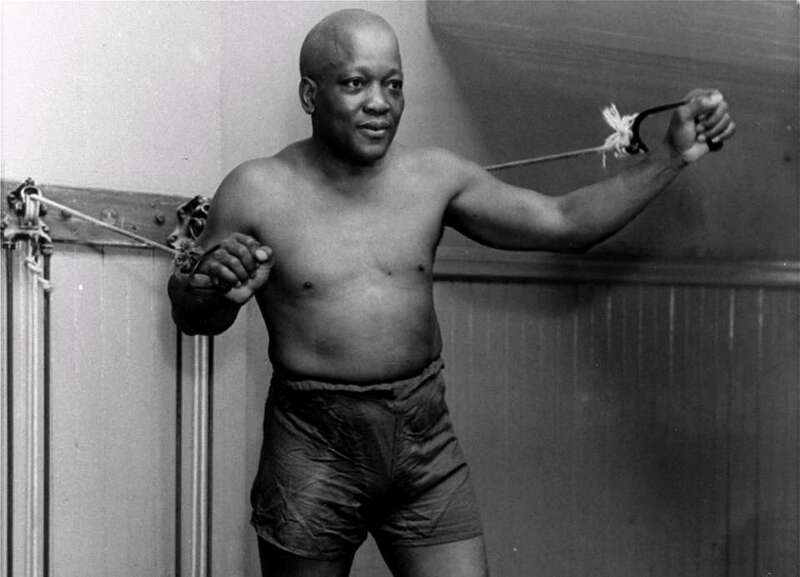 On Dec. 26, 1908, in Sydney, Australia, Jack Johnson beat Tommy Burns to become the first black heavyweight champion. That did not sit well with the American public. When Johnson returned to America, he was vilified, not celebrated. 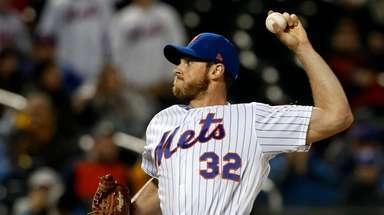 Within a year of winning the title, Johnson made five successful defenses, all against white challengers. As this was happening, the media, boxing insiders and political forces mounted an effort to find a man — a white man — who could defeat Johnson. It was decided former champion Jeffries would be the “White Hope.” Jeffries, who reigned from 1899 to 1904, had retired from the ring having never lost a fight. The fight took place on July 4, 1910 in Reno, Nevada. Fearing racial violence, promoters did not allow the sale of alcohol at the fight and firearms were checked at the gate. A crowd of more than 30,000 fans of both races jammed the arena — built especially for the occasion — and waited in the sweltering heat for the fight to begin. In round 14, Johnson sent Jeffries to the canvas three times — the first time in Jeffries’ career he had been knocked down — before the former champ’s corner threw in the towel. Johnson’s victory triggered race riots across the nation. Even though Gene Tunney comfortably won his first fight against Jack Dempsey, an immediate rematch was planned. Thus was the drawing power of Dempsey. More than 104,000 attended Dempsey-Tunney II on Sept. 22, 1927, at Soldier Field in Chicago. It produced a gate of $2.65 million, a record that stood for 50 years. It was another classic boxer-puncher matchup, with Tunney skillfully controlling the aggressive Dempsey with his left jab and nimble footwork. But 50 seconds into Round 7, Dempsey connected with a barrage of punches that dropped Tunney. As was his custom, Dempsey hovered over the fallen Tunney, waiting to attack once he regained his footing. However, before the fight, the Illinois State Athletic Commission implemented a rule that in the event of a knockdown, the opponent must go to the farthest neutral corner before the referee begins his count. By the time Dempsey was corralled into a neutral corner, six seconds had passed before the count even began. Tunney would recover and go on to win a unanimous decision and the “Legend of the Long Count” was born. 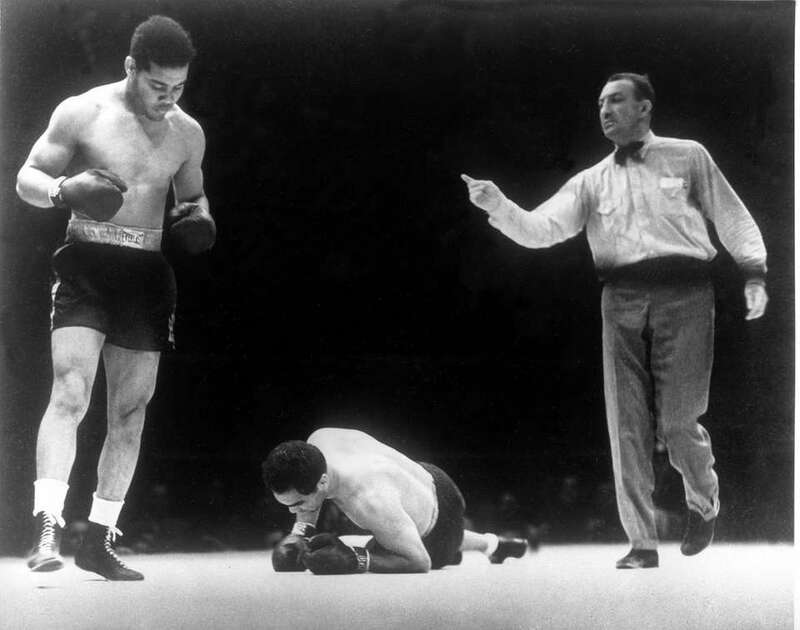 The second fight between Joe Louis and Max Schmeling lasted a mere 124 seconds. But its outcome lives forever as one of the major sports events of the 20th century. 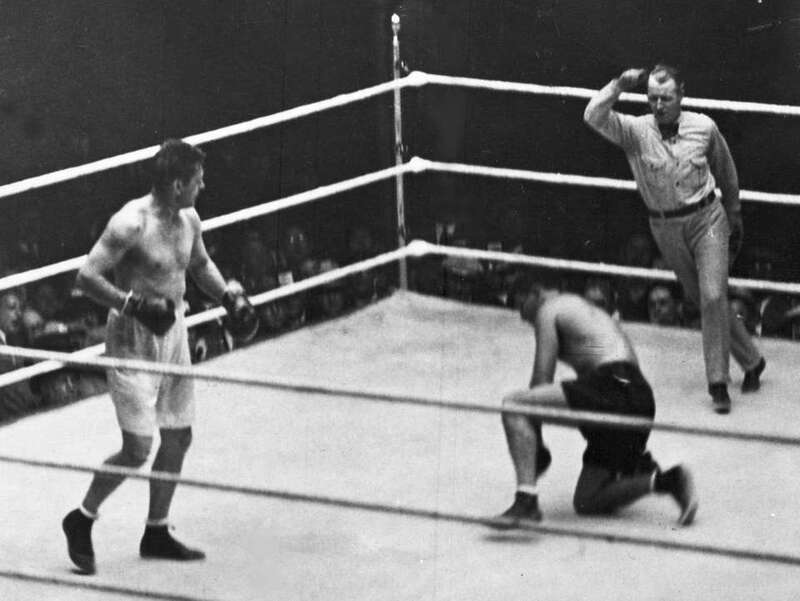 As the United States inched closer toward World War II, the rematch between Louis and Schmeling at Yankee Stadium on June 22, 1938, had worldwide implications. Adolf Hitler had risen to power in Germany and portrayed Schmeling as a symbol of racial superiority. A few weeks before the fight, Louis visited President Franklin Delano Roosevelt at the White House. The president reportedly gave him a pep talk, realizing the symbolism of what a victory over Schmeling would mean. Louis dropped Schmeling three times in the first round to win the fight. You want to talk about hype? When Joe Frazier met Muhammad Ali at Madison Square Garden on March 8, 1971, the storyline went much deeper than two undefeated heavyweights clashing for the belt. Ali had refused induction in the U.S. Army, was considered radical chic and seemed to embody the culture of the 1960s. Frazier was cast as a champion fighting for the establishment. More than 700 working press credentials were issued for the fight, including Frank Sinatra along the ring apron as a photographer for Life magazine. Barbra Streisand, Bill Cosby, Sammy Davis Jr., Hugh Hefner, Dustin Hoffman and Diana Ross were ringside. Burt Lancaster was part of the closed circuit broadcast team. All that, and the fight actually lived up to its billing as the "Fight of the Century." After 15 rounds of thrilling toe-to-toe action, Frazier won a unanimous decision. 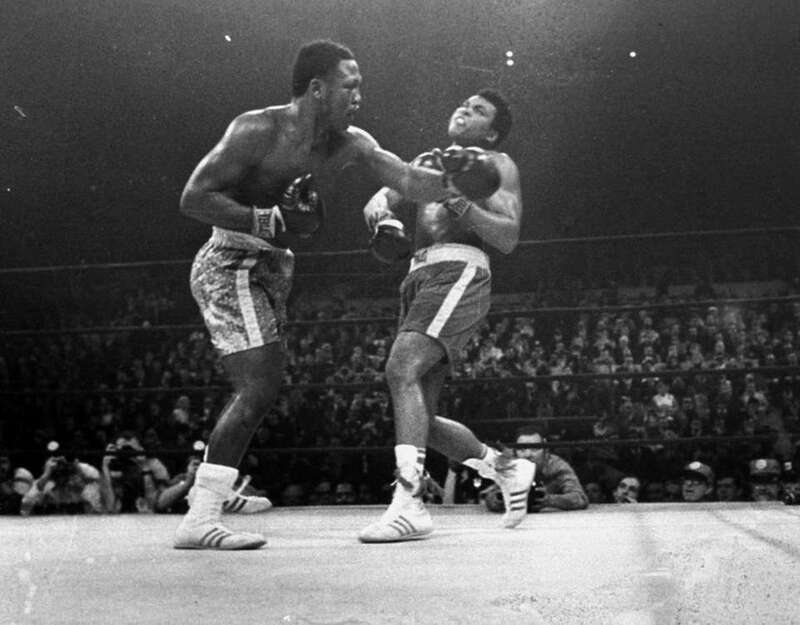 “The Brawl in Montreal” was considered the welterweight version of Ali vs. Frazier. The matchup between Sugar Ray Leonard, the welterweight champ and Olympic hero, and Roberto Duran, the rugged lightweight king, captured the imagination of even the most casual sports fan. Leonard played the role of the smooth boxer while Duran carried the reputation of “Hands of Stone,” a devastating puncher. They clashed on June 20, 1980, before 46,317 fans at Montreal’s Olympic Stadium. Duran took control of the action early and drew Leonard into a slugfest. 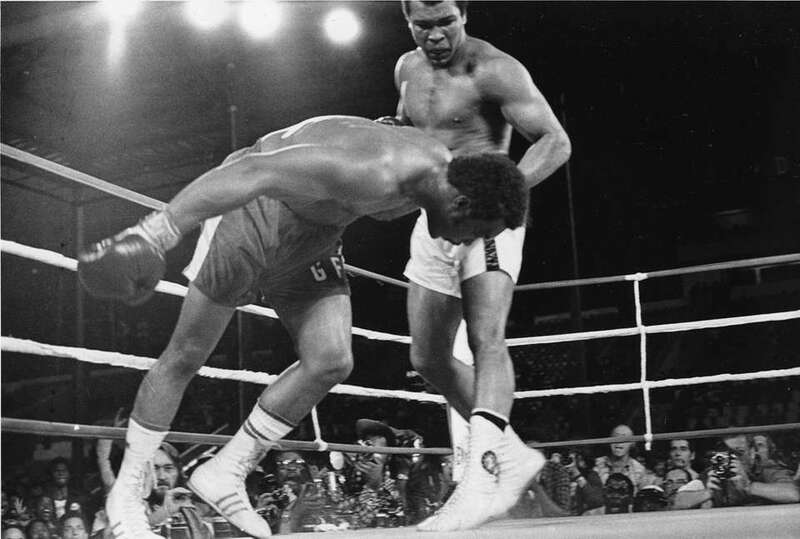 The fighters often battled toe-to-toe, which clearly benefited the Panamanian challenger. 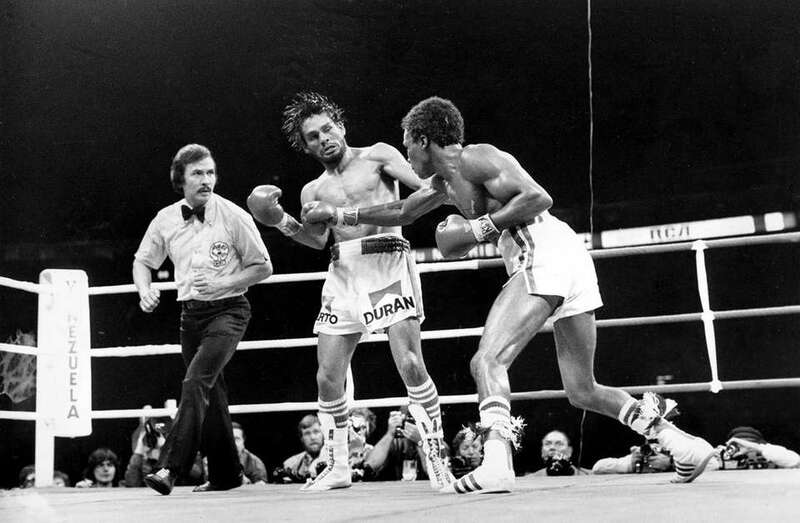 When it ended, Duran won the title with a close unanimous decision (146-144, 145-144 and 148-147). 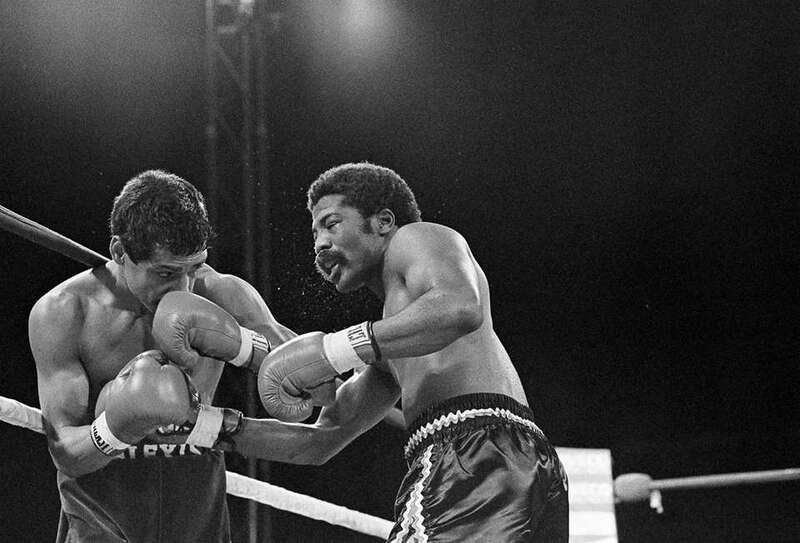 One of the best action fights of all time, the Nov. 12, 1982, match between Pryor and Arguello was named Fight of the Decade by The Ring magazine. Pryor defended his junior welterweight title with a 14th-round TKO of three-division champ Arguello at the Orange Bowl in Miami. Arguello was attempting to become the first fighter in history to win a world title in four weight classes. The pace of the fight was extremely fast, and Pryor seemed to dominate the early rounds. But Arguello was punching his way back into the fight and hurt Pryor at the close of the 13th round. That's when the controversy began. A television mic picked up Pryor's trainer, Panama Lewis, telling another cornerman, "Give me the other bottle, the one I mixed." Pryor clearly drank from a different bottle going into the 14th round. He went out and pummeled Arguello into submission to end the fight. It often has been speculated that the "black bottle" contained something that helped Pryor. The Miami Boxing Commission did not administer a post-fight urine test. Lewis and Pryor denied there was anything illegal in the bottle. Not since the first fight between Muhammad Ali and Joe Frazier had two undefeated heavyweights entered the ring able to call themselves heavyweight champion of the world. Tyson had unified all three of boxing's major titles — WBC, WBA and IBF — and Spinks was recognized as champion by The Ring magazine. Having defeated Larry Holmes for the title, he also was considered the lineal heavyweight champion. None of that mattered once the bell rang on June 27, 1988 in Atlantic City. Tyson knocked out Spinks in 91 seconds. At that point, it was the richest fight in boxing history, generating $70 million in revenue. Tyson earned a record purse of close to $20 million while Spinks pocketed $13.5 million. Spinks never fought again. The lead-in to their first bout on March 17, 1990, focused on their differences in the ring — Chavez’s power and Taylor’s hand speed — and out. But no amount of pre-fight hype could match what took place at the Las Vegas Hilton that night. Taylor, an Olympic gold medalist in 1984, and Chavez, a three-division world champion, put on quite a show. Going into the 12th and final round, Taylor had the lead on two judges’ score cards. All he had to do was coast for three minutes to win a split decision. Chavez pounded Taylor, who took the punishment — until the final seconds of the fight. Chavez dropped Taylor, who was given a standing-8 count. After it, referee Richard Steele stopped the fight with two seconds left. Evander Holyfield was 28 years old, the undisputed heavyweight champion and a legend in the making. George Foreman was 42, his heavyweight legend already made (only to be made again a few years later when he regained the title at age 45). 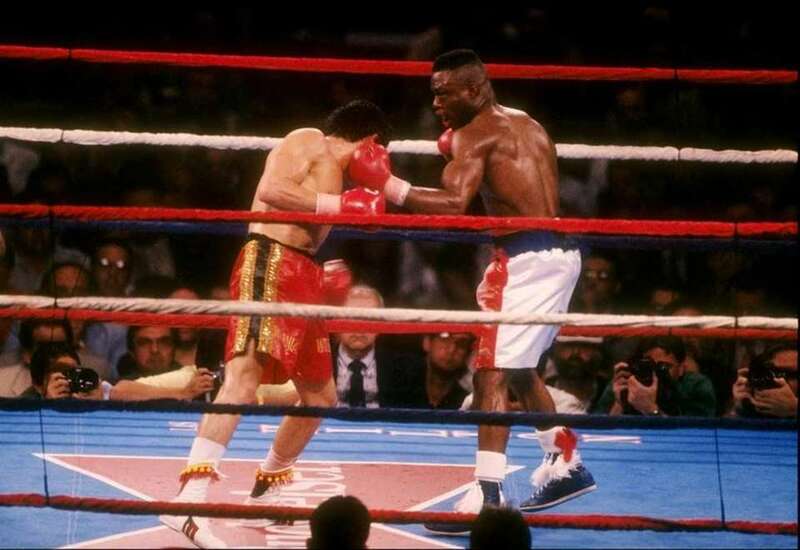 The “Battle of the Ages” took place in Atlantic City on April 19, 1991, and is remembered most for the seventh round. 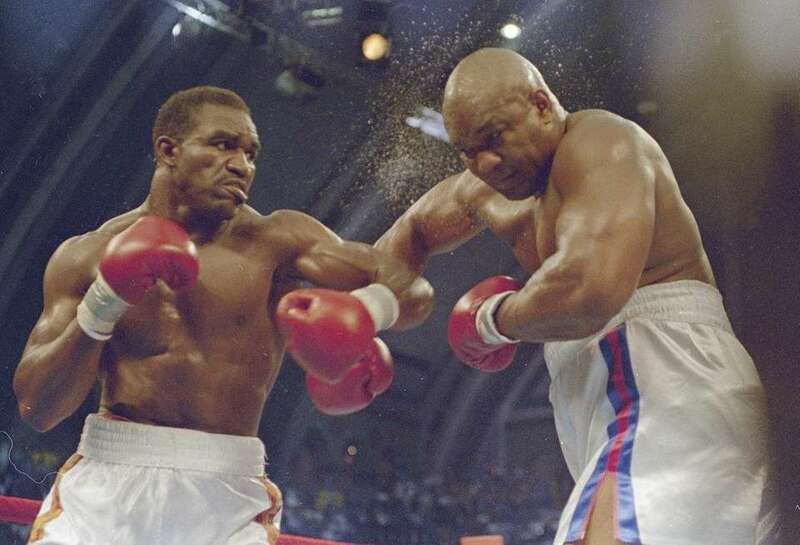 Holyfield began as the aggressor — until Foreman landed a right hook to Holyfield’s head. Foreman then went on the attack, but Holyfield came back in the second minute with a barrage of punches. Foreman withstood it and ultimately went the distance and lost by unanimous decision. The fight drew 1.45 million pay-per-view buys. 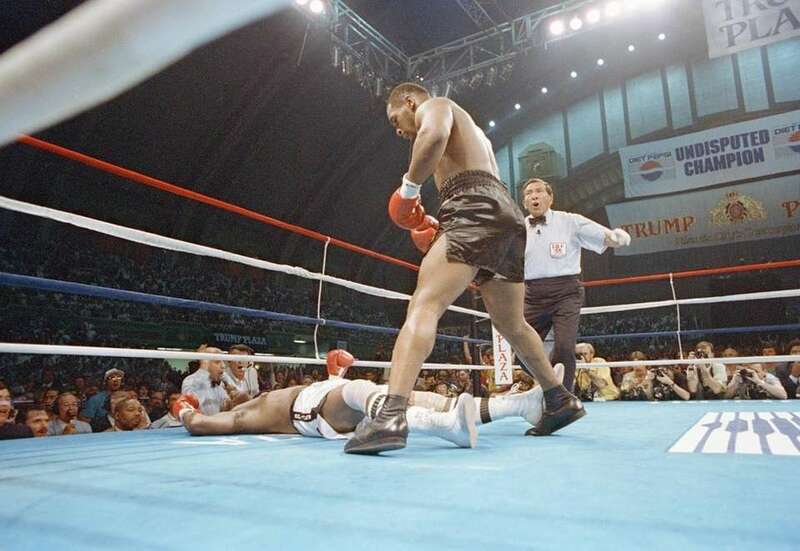 Infamously known as the “The Bite Fight,” the rematch between Holyfield and Tyson on June 28, 1997, was one of the most anticipated fights of the decade. 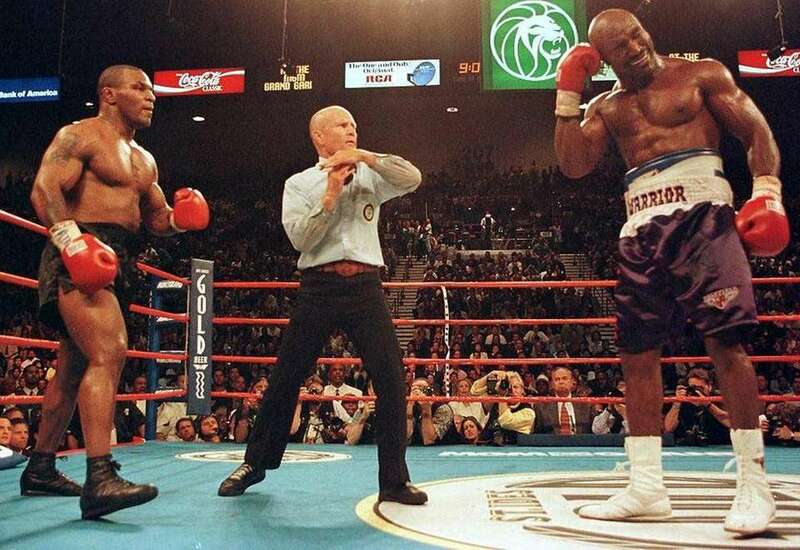 Seven months earlier, Holyfield had scored a major upset by stopping Tyson in the 11th round. In the first fight, Tyson complained about Holyfield head-butting him. Both fighters liked to punch on the inside, leading to numerous head butts. 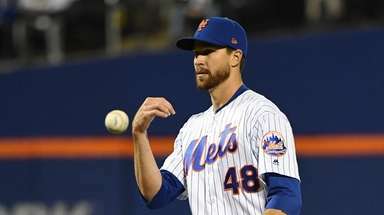 None of it, though, was considered intentional. The rematch was fought at the MGM Grand Garden Arena in Las Vegas. In the second round, an accidental clash of heads resulted in a cut over Tyson’s right eye. As the third round drew to a close, the fighters met in a clinch. It was during the clinch that Tyson bit off a portion of Holyfield’s right ear. 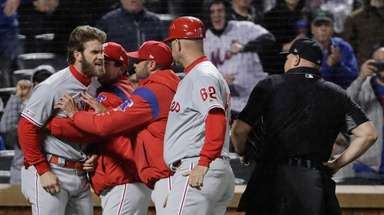 The fight was delayed while officials debated what to do. Tyson was penalized two points on the scorecard and the fight resumed. Moments later, the fighters again met in a clinch and again Tyson bit Holyfield’s ear. Once the round ended, Tyson was disqualified. Tyson’s boxing license was revoked by the Nevada State Athletic Commission and he was fined $3 million. 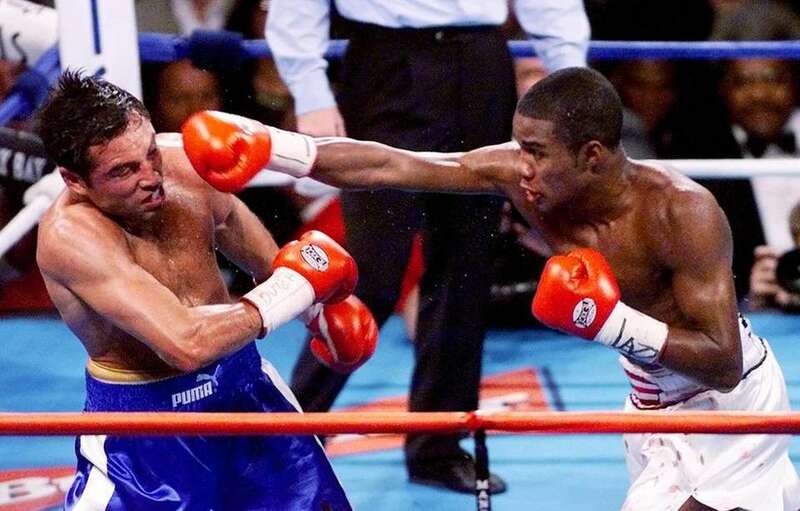 Billed as “The Fight of the Millennium,” this welterweight unification match took place in Las Vegas on Sept. 18, 1999. It also has been called the last of the superfights of the 20th century. As would become a pattern for much of his career, De La Hoya clearly outboxed Trinidad for the first part of the fight. But from the ninth round on, he began to fade. Figuring De La Hoya was far ahead, legendary trainer Gil Clancy advised him to stick and move in the latter stages of the fight. That strategy would minimize the chances of a desperate knockout. However, the plan backfired. Trinidad pressed the action and closed the show very strong. He ended up winning a majority decision. Many observers still believed De La Hoya did enough early to win the fight. The bout set what was then a pay-per-view record for a non-heavyweight fight with 1.4 million buys. 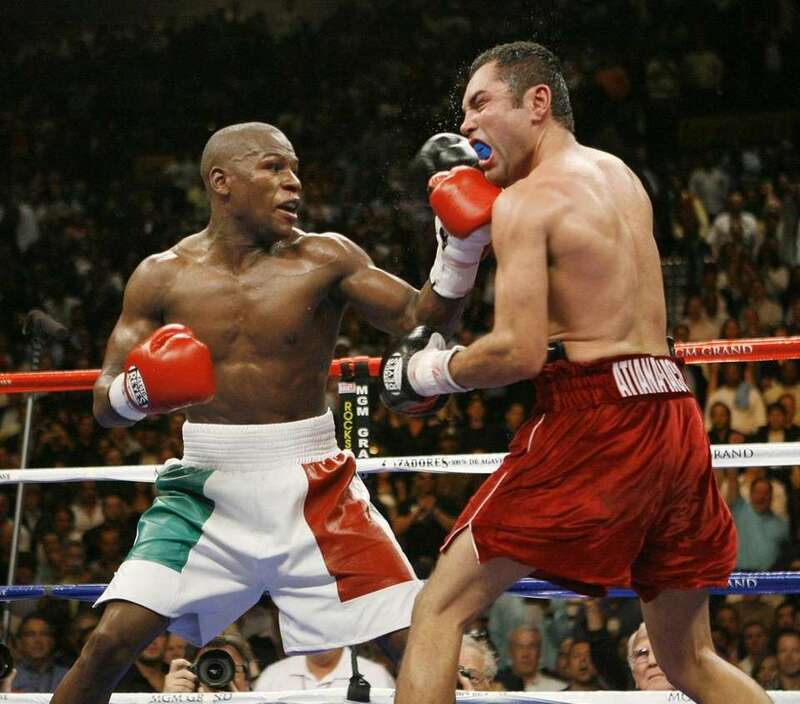 This fight took place on May 5, 2007, at the MGM Grand Arena in Las Vegas. Tickets to the fight sold out in three hours. There was such interest in the buildup to this fight, HBO developed a new series, “24/7,” which chronicled both fighters in the weeks before the bout. The “24/7” franchise- and its offshoots are now mandatory programming for all big fights. The bout was a tense chess match through the early rounds. Both men were known for their exceptional hand speed and it was on full display. De La Hoya seemed to eke out an early lead, but Mayweather’s sharp combinations gave him an edge in the second half of the fight. Mayweather won a split decision, the closest he has come to losing a fight in his pro career. The fight set the record with 2.4 million pay-per-view buys and was the most lucrative boxing match ever at the time with over $130 million in generated revenue. This was the fight that made Pacquiao a star. It was called "The Dream Match," and took place on Dec. 6, 2008 at the MGM Grand Garden Arena in Las Vegas. 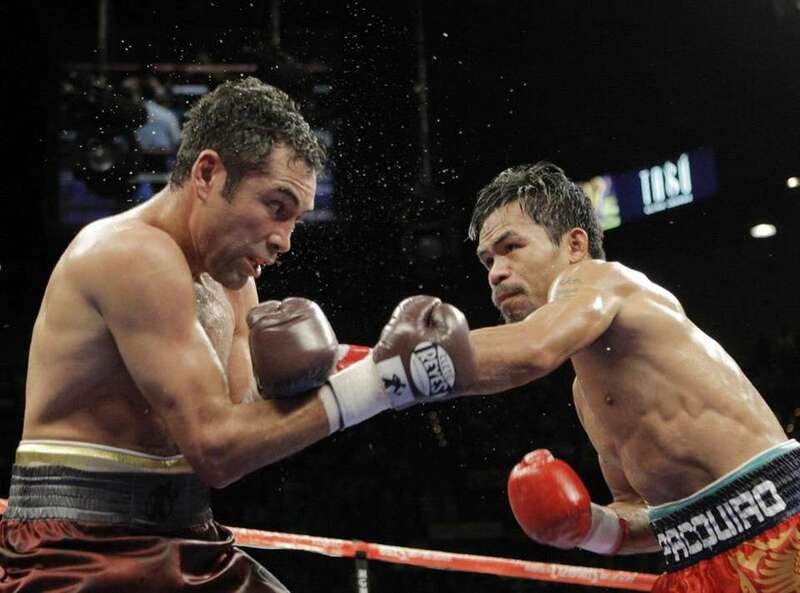 Although De La Hoya was favored and enjoyed advantages in size and reach, Pacquiao dominated the fight. De La Hoya refused to answer the bell for the ninth round. He would never fight again. The fight generated 1.25 million pay-per-view buys and totaled more than $70 million in PPV revenue. The fight itself was ordinary, but the business end was spectacular. 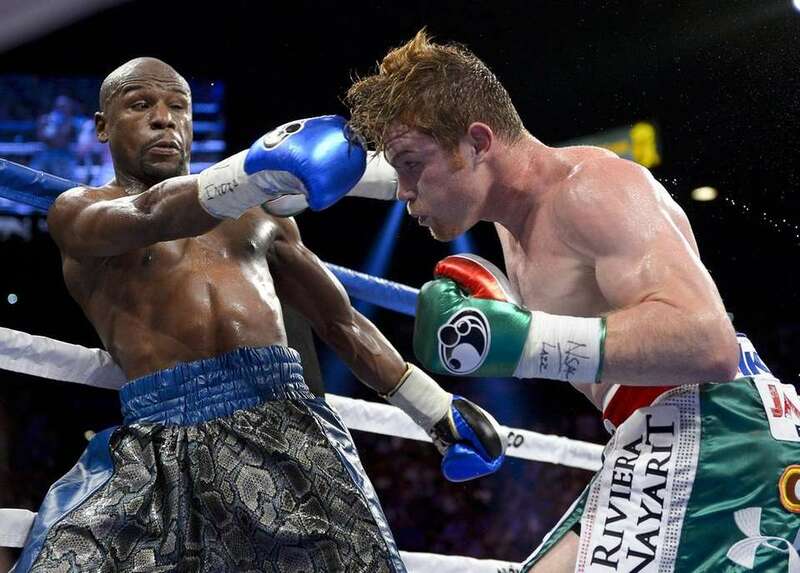 Alvarez had no answer for Mayweather’s speed and ring generalship on Sept. 14, 2013. For large portions of the bout, he simply followed him around the ring, unable to pull the trigger. Mayweather was awarded a majority decision, although many observers believed that Mayweather won by wide margins. Mayweather’s guaranteed purse of $41.5 million is the highest pre-fight "guarantee" in boxing history. 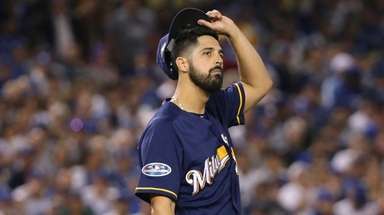 Alvarez received a guarantee of $12 million. 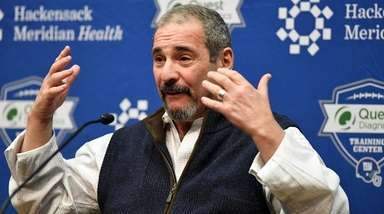 The bout generated $150 million in revenue from 2.2 million pay-per-view buys. The bout also generated a $20-million live gate. This fight was a long-time coming. Negotiations for a Floyd Mayweather Jr.-Manny Pacquiao fight began as early as 2009, when both men were considered the top pound-for-pound fighters in the sport. A variety of issues held up the fight, including both sides being unable to agree on the drug testing timetable for the bout. But finally, on May 2, 2015, Mayweather and Pacquiao met at the MGM Grand Garden Arena in Las Vegas. In the roughly six years it took to make the fight, Pacquiao entered the ring a slightly diminished fighter. Mayweather won a clear unanimous decision by the scores of 116-112 (twice) and 118-110. Pacquiao pressed the fight early but once Mayweather found his rhythm, he took control and never relinquished it. From an entertainment standpoint, the fight failed to live up to its billing. However, the fight became the highest-grossing match in boxing history. It generated more than 4.4 million pay-per-view buys and a $72-million live gate.